Do you upload your own photography samples on Facebook? If you do so, and you are not pleased with the quality, you should read this article. 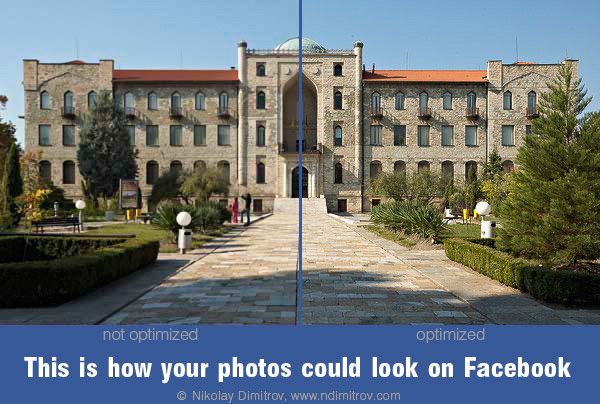 Facebook applies a very strong compression on all photos you upload. A great looking photo on your desktop could be completely destroyed in therms of quality when you upload it on FB. But here are the good news! If you prepare the photos carefully and with the right size, they could look on FB almost as good as in your Photoshop workspace. Lets start with the size. This is the most important spec of your photograph. Some time ago, FB used to resize large pics to a small common size. Now it’s different. FB stores the original uploaded photo and shows it non-altered in its picture viewer.. Well not completely non-altered, but with some stronger compression. So, the larger photo you upload, the better the quality? Not exactly, but close. I don’t know why, but computers usually show better pics with size to a multiple of 1024 pixels. So, if you make and upload on FB your photo 1024 pixels the longest side, it should look better like the same photo at 1000 or 1100 pixels. Strange, but true. But is 1024 pixels enough? I would say: no! With common large monitors, 2048 is a better choice. It renders even better and usually fits the screen very well. Sharpening is the second important factor when you prepare photos for Facebook. If you make your photos 2048 pixels wide, I suggest that you over-sharpen a little bit. It will make the photo look better when resized to fit smaller monitors and this is the most common case with this size at the time I write this. A smart sharpen filter with Amount 180 and Radius 0.3 will be enough, but sharpening is a personal choice and depends on your taste and of course – of the type and the content of the photograph. Using small compression amount is not a solution, while FB applies its own, I would say very strong, compression on all the photos you upload. If you use Photoshop, saving a JPEG with the Quality set to 9 will be quite enough. I resize with a simple Photoshop action, you can record it and use it with a single click in the future. Choose |File-> Automate-> Fit image| and input 2048 for Width and 1536 for Height. Click OK.
Notice: If you resize a smaller image, it will be interpolated to fit the above size and the quality will be lowered. After I have the resized image, I do the sharpening. If needed, I do local sharpening to pop-up some areas of the image, while keeping the rest or the photo artifact-free. I usually use Smart Sharpening, but depending on the photo, I sometimes do a Low Pass sharpening, which is better for larger images, but is slower to apply and sometimes returns strange results. After the sharpening, I save the image, using the File->Save For Web and Devices plug-in in Photoshop. Always upload your images with embedded sRGB color profile. Always put your watermark somewhere on the image. It is not a good protection against image piracy, but sometimes helps, especially if you go in court. Don’t be afraid of image piracy. It will always be out there, but it’s far more important that visitors of your FB page or profile see the real beauty of your photography work. Have in mind that the bigger size, the better all these lens and editing flaws are seen. So, upload only perfect images. © 2019 Nikolay St. Dimitrov. All Rights Reserved!